The Bridge of Deaths is cross-genre. It is primarily Historical, based on a real 1939 plane crash in Denmark. My maternal grandfather lost his life on that plane 20 years before I was born. I am not a trained historian or researcher, so the original version is fiction, basically a history book with over 200 footnotes with a fictional narrative weaving the storyline. The revised edition incorporated all the data into the narrative, to have the format of a novel, but it is the same book. I used traditional and untraditional methods for my research, the combination of traditional archival materials and untraditional use of psychics and past lives make the book also Metaphysical. The main characters Bill and Maggie have a nice love story. The short answer is; Pre WW II historical, Metaphysical, Romance and Mystery. On August 15th, 1939, an English passenger plane from British Airways Ltd. crashed in Danish waters between the towns of Nykøbing Falster and Vordingborg. There were five casualties reported; two executives from Standard Oil of New Jersey (one was my grandfather), a German corporate lawyer, an English member of Parliament, and a crew member on the plane. There was one survivor; the pilot. Just two weeks before, Hitler had invaded Poland. With the world at the brink of war, the manner in which this incident was investigated left much open to doubt. The jurisdiction battle between the two towns and the newly formed Danish secret police created an atmosphere of intrigue and distrust. It is very strongly based on true events and real people, The Bridge of Deaths is the culmination of 18 years of sifting through conventional and unconventional sources in Denmark, England, Mexico and the United States. The story finds a way to help the reader feel that s/he is also sifting through data and forming their own conclusions. The British Airways LTD plane the G-AESY, was a Lockheed Electra 10A like Amelia Earhart’s. In 2002 while researching in Denmark, I visited the site of the crash with a group of Danish people. A good friend whom I have known for years, an archivist, who was so kind as to place an advert on a local newspaper, found the daughters of the diver who retrieved the bodies and helped salvage the plane as well as other extraordinary sources. My friend told her that The Bridge, Storstrombroen was a landmark, ithe “last leg” on the drive to her grandparents to celebrate holidays and family gatherings. A policeman accompanying us said there was no joy on or around that bridge. He described how after my grandfather’s plane crashed, so many others fell in those waters. It was used by the Germans after the occupation of Denmark to shoot down allied planes on their way to bomb Berlin. 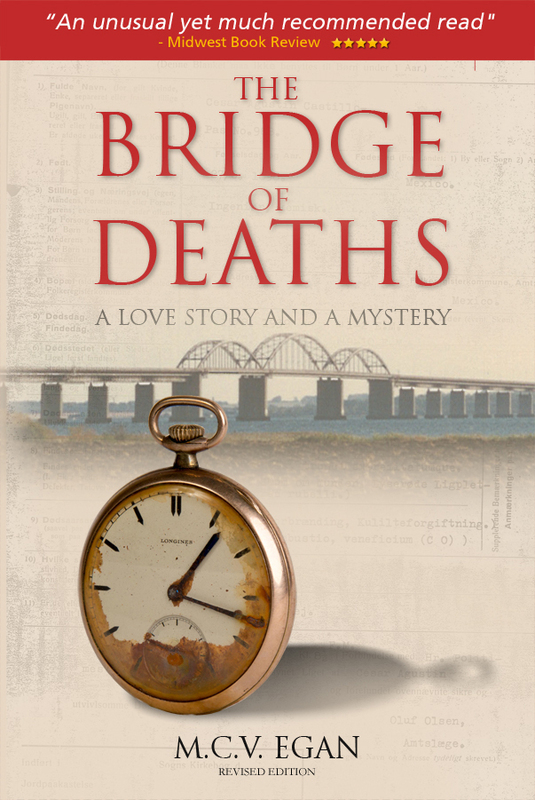 He also explained that in 2002 it had become a popular bridge for people to commit suicide; my original title was going to be The Bridge of Secrets, but the chill of all the deaths in the location made me chose THE BRIDGE of DEATHS. I was fascinated by the grandfather I never knew. My grandmother remarried four years after he died, and the only grandfather I ever knew was also an executive at Standard Oil of New Jersey, their New York offices were right in the 30 Rock Building. My step grandfather often compared me to the Castillo family, because of my ease in learning languages and my ability to win arguments. As I got older the interest became a bit of an obsession; not to the point that it interrupted my life, but a characteristic I imposed on the Catalina in the book. I did, however, spend my money visiting archives and researching the book as much as I could, while working and becoming a mother. I first held the British Airways Archives in my hands on January 1993, the book was ready on June of 2011, so it was an obsession. The obsession was with all the people involved; not just the victims of the crash, but Anthony Crossley British MP had such a fascinating trail of accomplishments and political involvements; and my grandfather’s loyalties were questionable as he was raised in Germany. What can I say, in 1939 all the passengers onboard the plane were men with quite a story and background, and the crew was also very intriguing. For this particular book the research was fascinating, I was allowed into the reading room at The British houses of Parliament, and met fascinating people along the way. In general when it comes to writing, the creating a story that will grab and excite reader, the unfolding of surprises…well the first draft! Editing and outlines. Restrictions and rules! A huge and necessary part, but not too fun. My outlines change often. I absolutely love W. Somerset Maugham. I love all his works, and he has a little known book bearing my name CATALINA published in 1948, which starts on August 15th; the day of the plane crash in The Bridge of Deaths and around Chapter Four when Catalina goes to confession; the priest is Father Vergara; my maiden name and the V in MCV Egan! I like many British authors, Susan Howatch, Nick Hornby, and Jeffrey Archer to name a few. Modern American writers I am a big fan of are John Irving, Irma Bombeck, and James Patterson. Every author I have read, read an article about, attended a lecture or workshop. There is so much to learn from all fellow writers. I am also influenced and inspired by many other forms of art. My home office with the lovely view I am so fortunate to have. I get visits from birds, insects, reptiles, and the occasional squirrel. I do not find them distracting, but I seem to look up at just the right time, to witness lovely creatures. In my younger days I modeled in Sweden and I was given many chances, but was hopelessly bad at it. Looking good in a photograph is an absolute art form I could not achieve, and I tried hard. Cross-genre books are VERY difficult to place and to market! It is far better to choose a genre and use just one genre for a book. Publishers have very limited shelf space for cross-genre books. I was meticulous and very passionate. I carefully organized my data, as each archive was different and they all complimented each other. 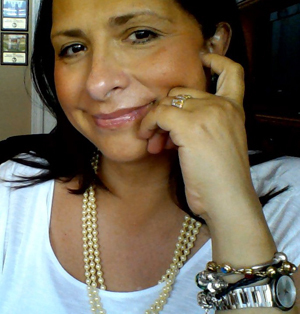 Start building your Cyber Footprint, blogging, tweeting, reviewing books. It really pays off to have “a brand” as a writer before you get a book out there. Don’t be afraid of rejection and get VERY THICK SKIN, not everyone is going to like your work or you, and people can be brutal! I am now writing Women’s Fiction and I released the first of a series called Defining Ways. Defined by Others was my first attempt at NaNoWriMo. I think that for me, the editing was so much work, because the pressure to write 50K words in a month was too much. I like to write and revise the following day, the way I write that would not have met the goal, but would have made the clean-up of the manuscript far easier! I still research a little to make the story believable, but the freedom to concentrate on the fun of a storyline is most welcome after all the work that went into The Bridge of Deaths. Thanks for a super interview, Maria. I enjoyed getting to know more about you. Best wishes with ‘The Bridges of Deaths’!